Belarus votes in controversial election Jump to media player People in Belarus are casting their ballots in the country's presidential election, with the incumbent Alexander Lukashenko widely expected to win. 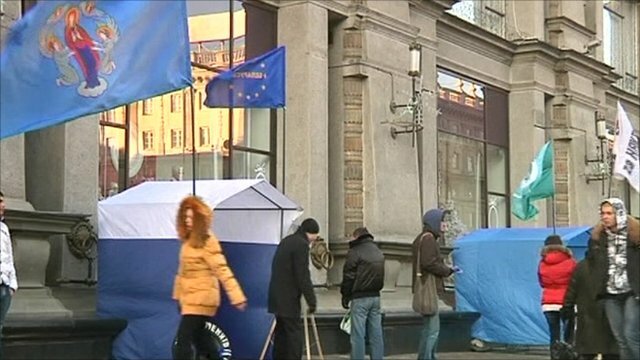 Fraud fears ahead of Belarus poll Jump to media player Opposition parties fearing electoral fraud in Belarus's election have called on their supporters to protest publicly if current President Alexander Lukashenko wins. People in Belarus are casting their ballots in the country's presidential election, with the incumbent Alexander Lukashenko widely expected to win. But there are widespread allegations of vote rigging, with opposition leaders calling on their supporters to take to the streets in protest.